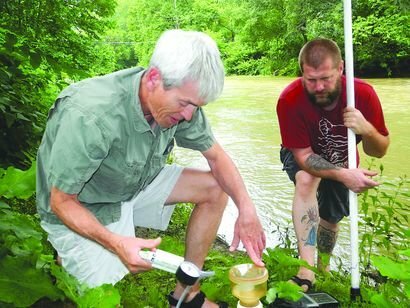 Wheeling, WV — Although many worry about the 1,076 chemicals the Environmental Protection Agency identifies as used in fracking, Wheeling Jesuit University biology professor Ben Stout is more concerned about the material already in the Marcellus and Utica shales he says is entering the water supply. In conjunction with West Virginia University, in early 2013, Stout and students began sampling streams and rivers across West Virginia, Pennsylvania and Ohio to determine possible fracking impacts. Stout said researchers are identifying high levels of bromide, a substance that can contribute to the formation of carcinogenic trihalomethanes, in streams and rivers near fracking operations. Wheeling Jesuit University biology professor Ben Stout, left, and student Sam Adams collect water samples as part of their ongoing Three Rivers QUEST program to monitor the impacts of Marcellus shale drilling. After drillers pump millions of gallons of fracking fluid – consisting mostly of water and sand, but also including different chemical combinations that vary per the choice of the driller – into a production well, much of this flushes back up through the well. The fracking fluid combines with minerals and mud from the earth to create the briny wastewater that contains bromide, Stout said. Stout said there are 12 sites that he and students monitor across the region, including three on the Ohio River at Sewickley, Pa., the Pike Island Locks and Dam, and at Ravenswood, W.Va. He said there have been some high readings for bromides collected at these sites as well, though not as significant as on Captina Creek. To continue and expand the sampling effort, officially known as Three Rivers QUEST, researchers recently obtained a $350,000 grant. The Colcom Foundation, a Pittsburgh-based private foundation dedicated to fostering a sustainable environment, has contributed more than $1.6 million to the project participants refer to as 3RQ. 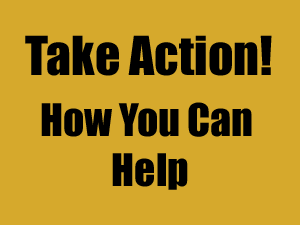 Stout said he does not formally share any of his findings with regulatory agencies, such as the West Virginia Department of Environmental Protection or the Ohio Department of Natural Resources. Stout also continues expressing concerns about the lack of specific information on tanker truck placards. Fleets of these trucks now travel throughout the Upper Ohio Valley daily in relation to work in the oil and natural gas industry. Fredericktown, PA — WTAE Action News has learned high levels of radiation — up to 60 times higher than the maximum allowed in drinking water — have been found in a stream that feeds into a water treatment plant. That water ends up in Pittsburgh. Ken Dufalla of the Izaak Walton League conservation group has been taking samples from 10 Mile Creek for years, frequently finding high levels of total dissolved solids. “I wouldn’t touch it. As you can see, I try to keep my hands off it all I can because I don’t know what’s in this water,” Dufalla said. To find out exactly what is in the water, he pressed the state Department of Environmental Protection to do comprehensive testing. The results showed levels of radium 226 and radium 228 totaling 327 picocuries per liter at one location, and 301 picocuries per liter of radium 226 at another location. In plain English, that means both samples had 60 times the EPA drinking water standard of 5 picocuries per liter. John Stolz, a biologist at Duquesne University, says radium can be hazardous. “The reality is, if it’s getting into the water that is being used as a source of drinking water, then it is a problem,” Stolz said. One big problem is water authorities cannot easily get rid of radium through the standard filtering process.